Luxury with Ease, from One Integrated System! Ease of use is one of the primary advantages of our systems. 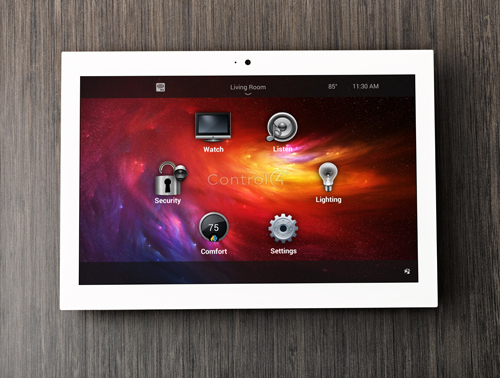 Our integrated, centralised controls allow you to managed everything in your home from one convenient spot. Now you can control your home with the touch of a button. We even have state of the art technology that can detect when you’re not home and set lights on so that it looks like your home is occupied. Our system also entails Audio Video distribution. This allows you to watch your favourite TV shows anywhere in your house, no matter your network provider – now you can finish off your favourite show in bed if you’re getting too tired for the sitting room. Our integrated system offers you much more than just iighting and audio video services, however. We also include heating and security into the mix. Managing all of these different aspects from one, easy system results in an efficient household and also produces lower energy bills. For example, like with your audio video services, you can choose which rooms need to be heated, rather than heating the whole house everytime. You can use special blind controls to maintain a cool temperature during the summer. Our system allows you to add any electrical system in your home to the control panel by use of a smart phone or tablet – your home will be the smartest home there is.